Pharmaceutical Name: Nodus Nelumbinis Rhizomatis. 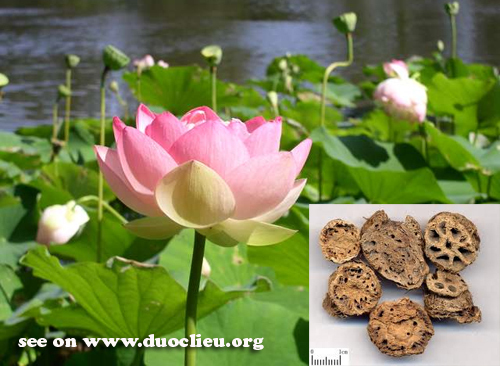 Part Used & Method for Pharmaceutical Preparations: The lotus rhizomes are dug in autumn or winter. The nodes of the rhizomes are removed, cleaned and dried in the sun. Functions: To promote healing and stop bleeding. Indications & Combinations: Hemorrhages, especially cough with blood and vomiting with blood. Lotus node (Oujie) is used with Bletilla tuber (Baiji), Biota tops (Cebaiye) and Imperata rhizome (Baimaogen).